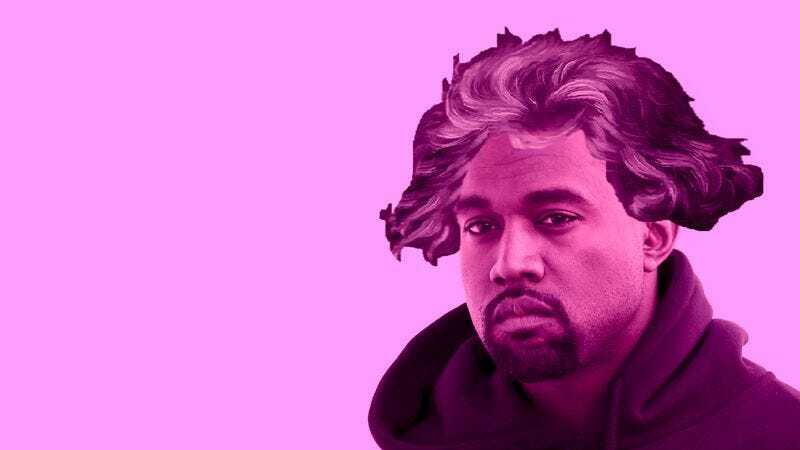 Kanye West’s been mashed up with everything else, so why not Beethoven? The pairing of West and Beethoven is anything but arbitrary. “You wouldn’t intuitively think of Kanye West and Ludwig Van Beethoven as being similar musicians,” explains conductor Yuga Cohler. “Obviously, they work within very different traditions. But if you listen a little closer, you’ll notice a lot of similarities.” Cohler illustrates this in the preview video, in which his orchestra plays a mashup of Beethoven’s Symphony No. 5 with “Blood On The Leaves” from West’s Yeezus album. The narration explains that the two musicians are united by their “brashness” and “wild contrasts and thrashing juxtapositions within a single bar of music.” Despite the implied insult to West, dragging him down to the level of a guy who not only died in the 19th century but couldn’t even hear toward the end, this sounds like an entertaining and enlightening musical experiment.